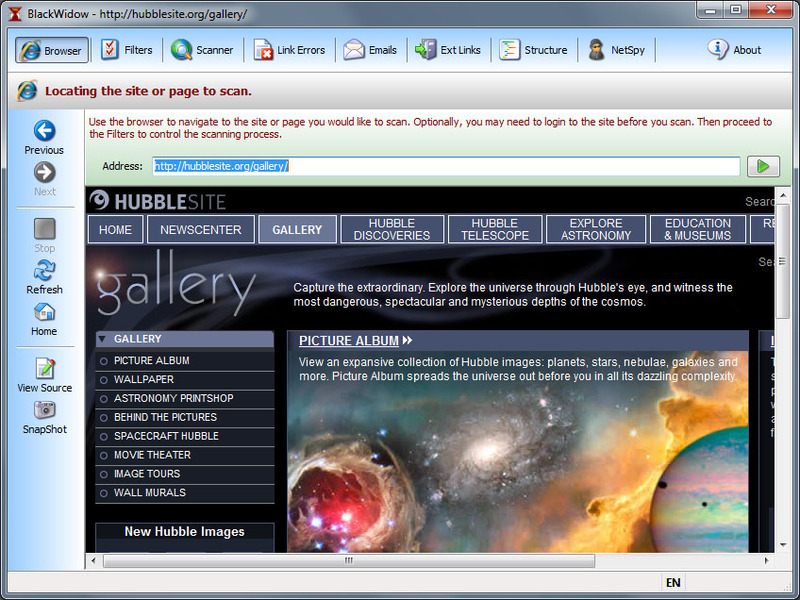 The embedded web browser allow you to navigate to the page you wish to start the scan. It allow you to login to a website requiring authentication. View the page source code to facilitate building your filters. View the source of all or any frames and iframes in the page. Create an image of the full page (including the scrolling area) and save it as a jpg or bmp. Create a thumbnail of the web page. User defined image width and height of the thumbnail. 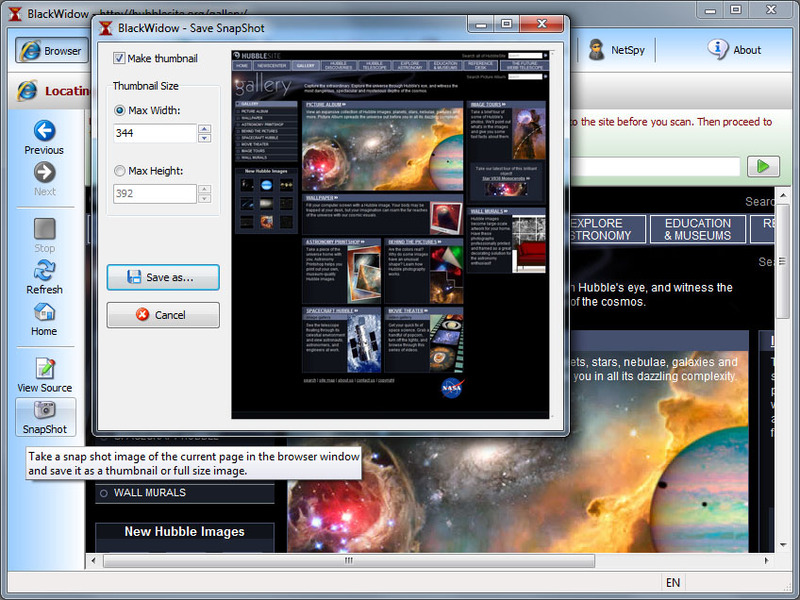 Real-time preview will resizing the window. Bicubic image resampler create sharper thumbnail images. Use filters to exclude what you don’t want to scan when scanning everything. Use filters to include what you need when not scanning everything. Take control of what the parser see by modifying the page before parsing. Substitute bad links for another when seeking for the best one, as in “the largest image”. Filters are easy to understand, they are in plain English. View exactly what BlackWidow is scanning for each connection. Connection details lets you see where it’s at and how long it’ll take to complete. Download while scanning, or scan only and download later. Slow down your scan on “spider sensitive” websites as if a human was browsing. View the website directory structure in an Explorer like window. Easily find what you need to download, or simply study the site layout. Use the “Files” selection dialog to perform task on the listed files. Export to plain text, tab delimited, as html links, as image links or xml. Spy on any programs accessing the Internet via HTTP and view every links they load. Apply filters to discard what you don’t want NetSpy to include. Save the found links in the Structure so you can download them later. Works for any programs, browsers and all. It is truly a “Spy”. 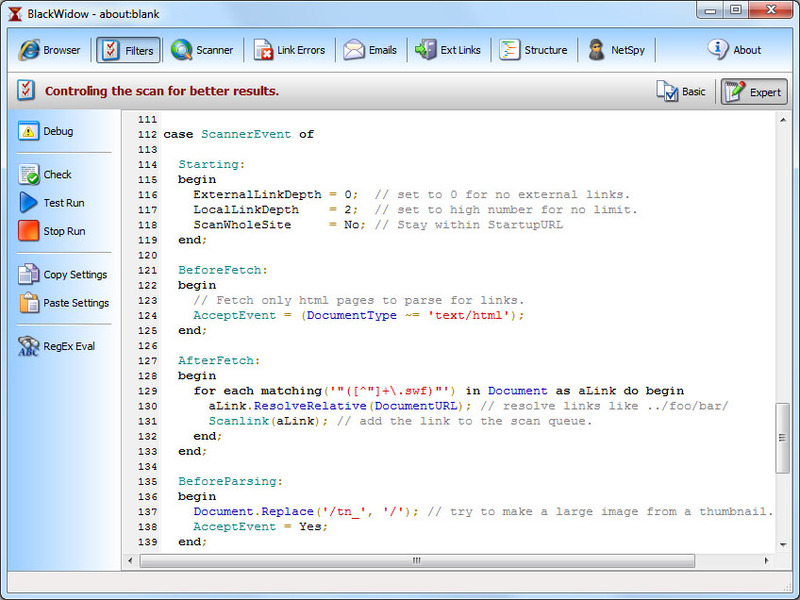 Control your scan at 100% using the scripting engine solely designed by SoftByte Labs. For every events fired by BlackWidow, your script is called, and you decide what to do. 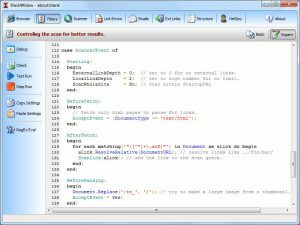 Includes a debug window to output anything you like in it, such as info found from online stores, real estate agents information, titles and keywords and much more. You decide. SBL (Spider Bot Language) is also used in our programmable spider BrownRecluse. It is an OOP language and is very easy to learn.